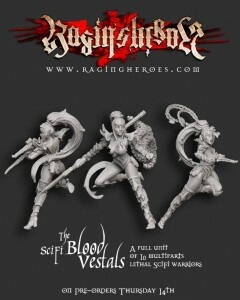 Raging Heroes has put up the Sci-Fi version of their Blood Vestals for pre-order over on their website. Don't worry, the photo's pretty work-safe this time around, thanks to star-edit. They will be available in the next 24 hours or so. Promise! In the meantime, here is a new render as well as a detailed answer to the many replies we received from you about these ladies.